April will be a busy month for the ‘March against Loneliness‘ movement. 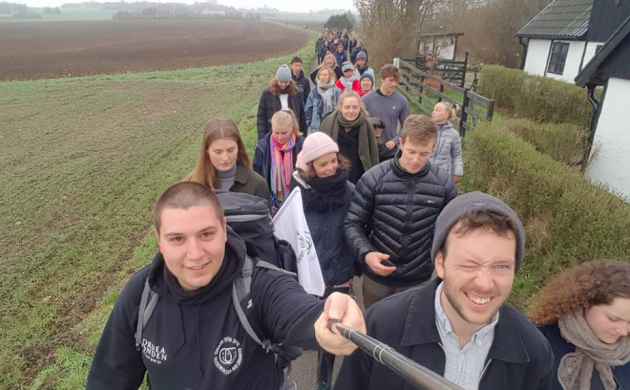 From April 1-28, it is planning a 550 km trek, which will start in Copenhagen, travel down eastern Zealand to Langeland and Funen, and then looping around up through Jutland to Aalborg. The aim of the march is to put loneliness on the national agenda as both a health and societal issue. Moreover, it is aimed at highlighting the necessity of community and social responsibility in combating loneliness. It is estimated that 35,000 people in Denmark feel that they are severely lonely, and the problem is particularly prevalent among people aged 16-29 and people over the age of 85. Studies show that loneliness increases the chance of high blood pressure, insomnia and depression. Long-term loneliness costs Danish society an estimated 8 billion kroner every year. ‘March against Loneliness‘ was started in 2017 in collaboration with ‘Civil movement against Loneliness‘, the organisers of several events aimed at combating loneliness in Denmark, such as communal dinners and other get-togethers. The movements are part of an international effort of civil initiatives in countries such as the UK and US. ‘March against Loneliness’ currently has 1,619 followers on Facebook, and the organisers are expecting a strong turnout for the walk.